Is your attic cluttered with old, unwanted furniture? Do you plan to redecorate and get rid of your existing cabinets, tables, or chairs? Call JDog Junk Removal Capital Region for all of your furniture removal needs. We can handle old furniture disposal on your behalf, so that you can focus on your property’s future rather than its past. From hauling away a single oversized sofa or shelving unit to clearing out entire rooms or homes, no junk furniture removal job is too big or too small for our pros. Plus, because we work with Habitat for Humanity to repurpose items that are still usable, you can rest assured that, if possible, your secondhand furniture will be going to a good cause. Ready to book our furniture removal service?  Contact JDog Junk Removal Capital Region today! Our furniture removal service is ideal for home cleanouts, including foreclosure and estate cleanouts. We can also assist you with office furniture removal, if you’ve just purchased new cubicles for your employees and need to clear away the old pieces before the new ones can be delivered and installed. And of course, if you’ve simply decided it’s time for a new living room couch or nicer bookshelves in the master bedroom, we’re standing by to pick up whatever you no longer want or need. When it comes to furniture removal in Schenectady, you can trust us for skilled and efficient service. Worried about the cost of hiring a professional to remove furniture from your home or commercial space? JDog Junk Removal Capital Region offers free estimates to help you plan ahead. Our estimate includes both the labor to get the items out of your building and any costs related to hauling things to their final destination. We take pride in our honest and competitive quotes. Among furniture removal services in Schenectady, you can trust JDog Junk Removal Capital Region for great service at a great rate. We’re a fully insured, veteran-operated company, and we have five years of experience under our belts. Our commitment to customer service is unparalleled. Need a timely turnaround? We’re available for emergency appointments when unwanted furniture removal has to happen ASAP. Book with JDog Junk Removal Capital Region and expect to be a satisfied customer. Call now!